Born 19 October, 1930, in Glasgow. Died 5 February, 2016, in Cardross, Dunbartonshire, aged 85. The Rev Archie Ferguson, a distinguished, far-travelled Fellow of the Royal Institute of Naval Architects who was one of the first auxiliary ministers recruited by the Church of Scotland, has died aged 85. The Rev Mr Ferguson, who was the youngest of three children, had two sisters, Nan and Betty, who is now in her 95th year. Their father was a railway engine driver in the days of steam locomotives and his mother was a seamstress who was left to bring up the family after her husband died, when Archie was just seven. He had a very happy childhood in Helensburgh, where the Church of Scotland played a very important part in the family’s life, giving Archie the grounding that eventually would lead him towards the ministry. His friend, Peter Foster, told the large congregation in Cardross Parish Church for Archie’s funeral service, conducted by the Rev Maggie McArthur, that in those early carefree days, Archie liked to go beach combing on Helensburgh shore, where the amongst the flotsam and jetsam he once discovered a military incendiary device. On more than one occasion, Archie constructed a makeshift raft out of planks and sailed it from Helensburgh to Ardmore Point. His love of all things maritime stemmed from the large amount of time he spent on the shore at Helensburgh, watching the passing pageant of large merchant ships on the River Clyde. The sea and ships were to become his life-long interest and he pursued that interest during his boyhood days in the Sea Cadets. He went to school at Hermitage Academy before going to work in the drawing office of Denny’s shipyard in Dumbarton Drawing Office and pursuing his education at night school in the Royal College of Science and Technology, which later became Strathclyde University in Glasgow. Archie was called up for National Service where he was accepted for Air Crew in the Royal Air Force, qualifying as a Flight Engineer on Lancaster Bombers. He loved flying and enjoyed showing off with his pilot pal Mal McDougall, which they did once by indulging in some fancy aerobatics while flying over the farm where his where his soon-to-be wife, Margaret, then lived. The couple were married in 1958 in Rhu Parish Church and then moved to Teddington in Middlesex, where Archie was employed in the National Physical Laboratory, specialising in Sea Keeping Research. It was while working there that he published several scientific papers. It was with the benefit of this knowledge and expertise that he began many trips around the world. The Fergusons eventually moved back to Scotland where Archie took up employment as a Lecturer and Superintendent of the Ship Model Test Tank of the Naval Architecture and Ocean Engineering Department of Glasgow University. It was here that he gained his Master of Science Degree and Doctorate as well as a degree in Civil Engineering and Archie was honoured by being appointed a Fellow of the Royal Institute of Naval Architects. Archie travelled the world giving lectures and attending conferences during which time he forged many friendships. He and Margaret became wonderful hosts sharing their home and their hospitality with students and visitors from countries as far afield as Japan, Russia and Poland. Many of them keep in touch to this day. He continued to work in the Department for Naval Architecture for the following 20 years during which time Archie and his colleague Bob McGregor established their own consultancy, Ostec Navigation. Using his vast knowledge and skills, Archie worked on a project for British Waterways, who asked him to investigate possible new designs for narrow boats. The result was a new shape of boat which led to a wide take-up by hire fleets and saved much of the erosion of canal banks. Archie was further honoured by being appointed Honorary Superintendent and Curate Adviser to the Denny Tank at the Scottish Maritime Museum in Dumbarton. In Cardross, Archie and Lorna saw the birth of their two children, Lorna and Douglas, and became involved in the life and work of Cardross Parish Church where he was appointed Elder in 1970 and eventually Session Clerk, a post that he carried out in his usual quiet yet effective and efficient manner for 12 years. 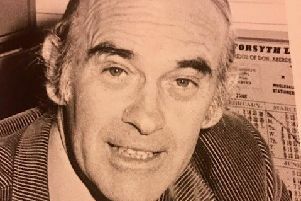 Then, in the late 1970s, the General Assembly of the Church of Scotland established a committee, in which the Cardross minister, the late Rev Andrew Scobie, was involved to look at recruitment to the ministry and it produced the plan for an auxiliary ministry. Cardross Parish Church was chosen to look after two of the very early students of this new-style ministry, the late the Rev Harry Dutch, head of public relations for Strathclyde Regional Council, and the late the Rev Roy Wilson, who spent time in training there. Witnessing these new developments, Archie himself felt called to serve the church in this way and so began a spell of arduous studying, essay writing and practical training, culminating in his Ordination to the Ministry of Word and Sacrament in 1988. During all of this time, Archie continued his work with Glasgow University as a Lecturer and Head of the University Research Tank for Ship Models and Sea Keeping. His service to the Church and the Auxiliary Ministry would extend to more than 25 years, during which time he made many new friends and gave comfort and support to countless people, all the time with the straightforward, quiet and effective style that was the very hallmark of his life. He was generous with his pulpit and was always keen to share this and worship with others as he affirmed people’s faith encouraging many to become involved in the work of the church. The Rev Mr Ferguson was first appointed to Dumbarton West Kirk, where he spent five years and where he enjoyed his time there, especially as the boys from Kiel School attended worship regularly. He would recall how he became quite adept at dodging the paper aeroplanes that the boys made out of the Orders of Service, all of which helped to make worship lively and interesting. It was while working there that Archie was interviewed by Harry Secombe for the STV Highway Programme. From there Archie moved on to Craigrownie Parish Church on the Rosneath Peninsula and from there to Renton Trinity Church and Jamestown Parish Church in Vale of Leven. He also held posts at Dalmuir Barclay, St Cuthbert’s Clydebank, Cairns and St Luke’s in Milngavie and Kilmaronock/Gartocharn and Luss on Loch Lomondside. It was then back to the housing scheme parish of St Andrew’s in Bellsmyre, Dumbarton, where Archie had started out on his probationary year. He stayed here for a further five years enjoying the support of the congregation and Office Bearers. He recalled and spoke proudly of the close relationship that he helped establish with the Catholic community, especially with the late Father Thomas O’Rourke of St Peter’s. He also had a great rapport with the pupils of Aitkenbar Primary School, encouraging many of them to take part in morning worship on several occasions each year. The Rev Mr Ferguson is survived by his wife, Margaret, and their children and grandchildren – Alan, Lorna, Fergus and Rachel, Douglas, Alison, Alistair, Andrew, Robbie, Callum and Annie, all of whom were present recently at a special birthday celebration for Margaret, to whom he had been married for 58 years. His funeral took place to Cardross Crematorium.